In what could be a sign to come for the newest term of Hong Kong’s Legislative Council, three newly elected members used their swearing-in to literally swear at China and promote their pro-independence agenda. Making sure that their presence was felt, Sixtus “Baggio” Leung Chun-hang, Yau Wai-ching, and Edward Yiu Chung-yim all added phrases to their oaths. Twenty five-year old Youngspiration lawmaker Yau Wai-ching dressed un-congressionally in a white t-shirt went the furthest and referred to China as the ‘People’s Ref**king of Chee-na’. 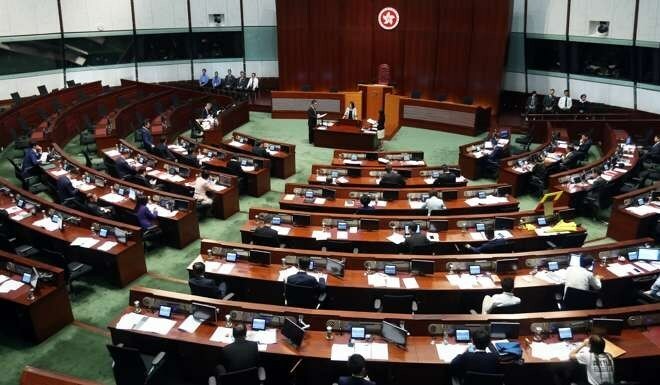 Legislative Council Secretariat Kenneth Chen Wei-on rejected the oaths of the three lawmakers questioning whether the trio actually understand their words as they laid out a flag printed with the English words “Hong Kong is not China”. Many opposition lawmakers have attempted to use their swearing-in as an opportunities for protest by mumbling or coughing during the phrases ‘People’s Republic of China’ and ‘Hong Kong Special Administrative Region’ but have been forced to retake their oaths again. Baggio Leung insisted that their oaths were complete using the excuse of local accents as the reason for the mis-pronunciation of China as “Chee-na” and the “People’s Republic of China” as the “People’s Refucking of Chee-na”. Nathan Law Kwun-chung another newly elected lawmaker claimed that the Legislative Council Secretariat does not have the power under the Oaths and Declarations Ordinance to invalidate the ‘poorly pronounced’ statements. A spokesman for Youngspiration also claimed that the lawmakers wore that pro-independence flag as a ‘fashion statement’. The lawmakers will have to retake their oaths properly at a later date to formally begin their terms in the Legislative Council. The changing of the oaths has sparked controversy and debate among many in Hong Kong and the Chinese diaspora community around the world. Many believe that the post-Umbrella Movement pro-democracy movement which fueled the rise of radical parties such as Youngspiration has deviated from the original means of ‘peaceful protest’ that was a feature of the 2014 Occupy Central protests. Some commentators believe that the insult to China is a sign of the young lawmakers immaturity and believe that they may have already peaked politically. Others have condemned the stunt saying that their inability to fulfill their oaths signifies an inability to affect genuine change in Hong Kong. For the record: Hong Kong is a part of China. Being Chinese doesn’t automatically make you a Communist. The Communist Party does not represent the whole of China. Next Post:Shall we mourn the Herald’s dusk?